“The launch of this technology is another in a long list of firsts for Audi,” said Audi of America President Scott Keogh of the system that will be officially activated in Las Vegas at the end of December. To begin with, the V2I system will be very basic. Owners of select 2017 Audis will be able to display on their dashboards (or via head up display) if the oncoming traffic lights are red or green and, if the former, how many seconds remain until the lights change, again. The idea is simple. Knowing how long there is to wait relieves stress and allows drivers to get ready to pull away. Or, if the lights are going to change as the car approaches, to find the optimum speed to pass through without having to stop, therefore saving both time and fuel. But this is just the beginning. Audi aims to use the information broadcast from connected traffic lights to recalculate programmed routes in real time to reduce fuel use or avoid congestion. It is also planning to link the information to a car’s stop/start feature so that the car automatically comes to a halt with the engine shut off at red lights or finds the perfect approach speed so that the car never needs to stop at all. 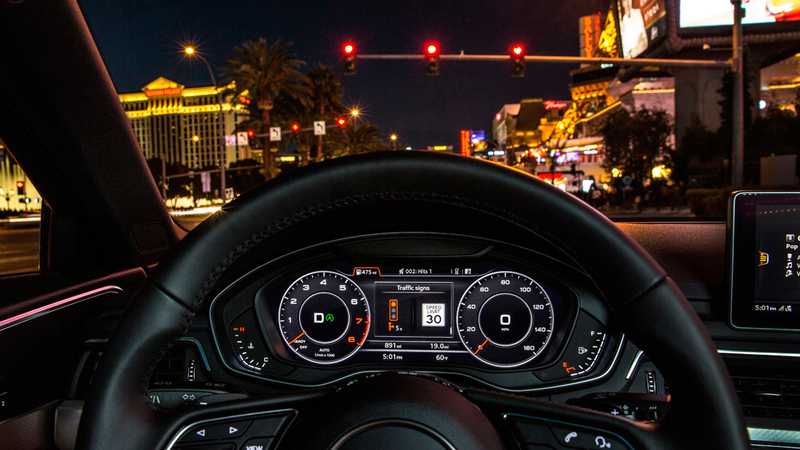 “The Regional Transportation Commission of Southern Nevada is proud to be the first in the nation to connect our traffic signal network to vehicles through our collaboration with Audi,” said Tina Quigley, RTC General Manager.